Our most popular control, FlexGrid, has a base size of under 150 KB. In addition, Wijmo controls have no dependencies. Charts, grids, and other controls are all designed to be mobile-first, with familiar features and UI, including Excel-like filtering, sorting, and merging. Everything is an extension in Wijmo. Our easy-to-read, flexible API has a low learning curve, and ontrols are designed to have a simple core with as many extensibility points as possible. Globalization for 40+ cultures is included. 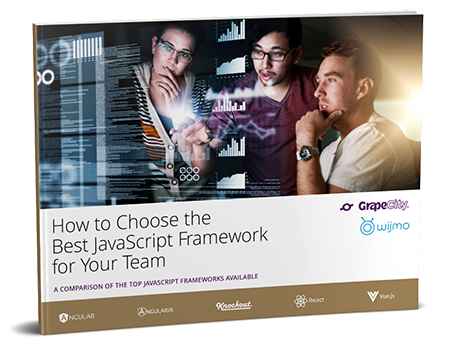 Built to be framework-agnostic, Wijmo includes full support for Angular, AngularJS, ReactJS, VueJS, and Knockout. Controls are the same across frameworks.